As local record shops vanish, apart from personal memories little often remains. I love finding the original store bags, though their survival owe a lot to chance. This batch came my way at the weekend. I was browsing some very tatty stock at an antique centre and found a small a pile of singles stuffed inside original store bags. I rescued one of each. The dealer had slapped large stickers across to explain what the record inside was, but I figured I should chance being able to remove these. The next battle was to persuade the staff not to rip the labels off for their stock book. Then to throw the singles, which were in such astonishingly bad condition I immediately chucked them away to prevent further damage to the bags (forgetting for the moment my maxim to donate anything like this to Oxfam). Normally I’d gripe about someone trying to sell records so bad, especially at £3 a pop, but on this occasion I was more than grateful for the ‘make do and mend’ mentality of the older generation which had preferred to recycle the paper bags – for some fifty years! I left the sleeves a day to flatten out a bit before tackling the stickers, but they came away with patience and lighter fluid. Which left six old seven inch single bags to tell their story. Five of the more important Sheffield shops too. Wilson Peck we have already mentioned on the site, but these are the first seven inch bags from the shop I’ve found. Clearly they just took whatever pattern the wholesaler could supply and over-printed their logo and details. I like their motto though: “The Centre Of Sheffield – The Centre of Music”. Vallances was a general white goods and electrical chain begun in the 1920s with branches in may local towns, and like many of their ilk had a small record department. The Bradleys bag is quite a bit later, from the seventies, but does perhaps show that whoever owned the records originally kept up the habit for many years. There were a couple of Bradleys shops in town, and they may also have had branches elsewhere in Yorkshire. The most unusual bag is that for W.H. Curtis which proudly claims to have shops in three counties. In the fifties they had six branches in Sheffield. Given the design and names of some of the record labels named, this bag probably dates from the early fifties, maybe from their original shop on Porter Street which was cleared away during redevelopment work at the end of that decade. 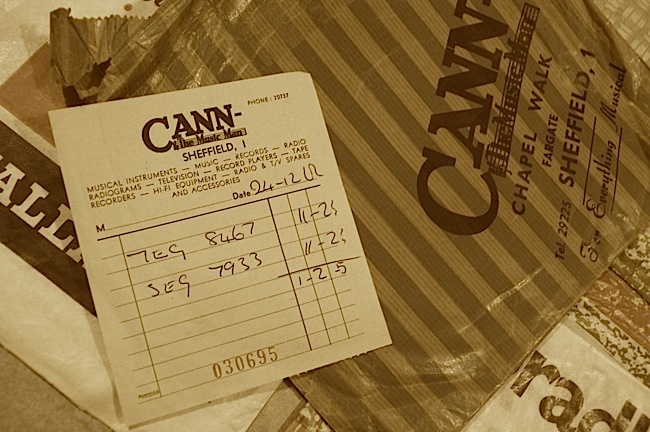 The best find in many ways was the Cann’s bag. As I was photographing this I realised there was a piece of paper inside; the receipt from the day it was bought. I’ve been told by someone who worked here that staff at Cann’s had to learn the catalogue numbers of the stock, rather than relying on artists and title. And sure enough the receipt gave just the catalogue numbers, but that was a start. A little work showed that someone did a bit of last minute Christmas shopping on December 24th 1959 at Cann’s on Chapel Walk (where the shop had moved from their original premises on Dixon Lane). It was probably a gent, no woman would leave it that late! He bought two Extended Play records, and paid 8s each plus purchase tax (a sort of forerunner of VAT but with varied rates) of 2s 11d halfpenny. So a total bill of £1.2s.5d which, given that average wages then were around £13.20s for a manual worker and £17.70s for a non-manual worker, was quite a hefty sum in 1959 (and equal to about £15.60 in 1988 prices – and we were certainly paying nothing like that for two EPs then). The first EP (7EG8467) was a studio cast recording on HMV from a work called Wild Violets; the other (SEG7933) an EP of Reginald Dixon called Memories Of The Tower, which had only been released on Columbia the previous October. Cann’s clearly wasn’t the cheapest shop in town, charging about 2d about the recommended retail price, but then they were very well stocked. The shop kept going at least into the seventies . I used to go there quite a bit in the early 70s, and it still had an impressive bank of listening booths even then. Their boast of “everything musical” on the bag was far from idle too; they sold sheet music, instruments, radios, television sets, tape recorders, record players and hi-fi equipment (our mystery buyer got the mono editions, so had yet to be lured by the marvels of stereo record players which were new on the market), spares and accessories as well as records. I’ve recently sorted out all my old record store bags, so will get some photographed anon. If anyone out there has any local ones, do get in touch. At an estate auction in with a bunch of 78 records with paper sleeves I found about a dozen “Paper carrybags”. These were used to put records in. At the top you folded it and punched out a tab to make a carrying handle. I think they are rare, I’ve been at it for a long time and never seen them before. One says “Cohoes carrybag” on it. They have record company names and advertisements on them. I’d love to see one of these Charly. I would like to print up some of these for a record show. 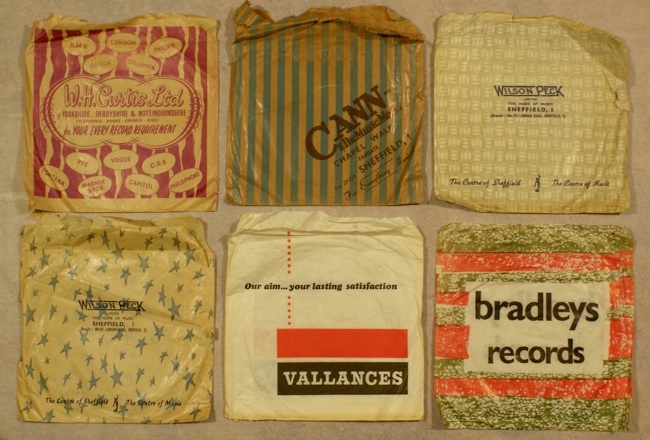 What’s was the “usual” size of these record bags: 12.75″ wide? (or 12 5/8″?) and maybe 15″ high with a die-cut handle? Thanks…bd. Bill, I’ve dropped you an email with what I know.